So firstly, apologies galore. I've not blogged in the last 2 weeks but that does not mean I haven't been busy in the kitchen. I have. But we went away for an Easter break so I have also been enjoying the cakey-bakey goodies that Paris has to offer. In fact I rather overindulged in cheese, wine and patisserie! We stayed in an apartment right on the edge of the 1st and 2nd Arrondissement that was literally a stone's throw from a market street filled with ice cream parlours, bakeries, butchers, wine shops, flower shops, bistros....it was an amazing location. I'm hoping to take some inspiration from the trip so watch this space. Saying that though. Easter isn't complete without Hot Cross Buns, and whilst the Parisians lulled me into a food coma they didn't do Hot Cross Buns. I however do! I have a recipe folder filled with a ton of recipes that I have never tried. I tear them out of magazines and file them away, never to attempt. In fact one of the reasons I started writing the blog was to actually start making these recipes. With the lead up to Easter the supermarkets, bakers and my mum start stocking up on the Hot Cross Buns. I've spent a couple of weekends at the folks recently and have been loving toasted, butter smothered Hot Cross Buns for brekkie. So, given my recent bread/dough successes I felt confident enough to give the Hot Cross Bun recipes a go. I'm pretty certain this recipe is a Delia and certainly is seems pretty similar to the one listed on her website. 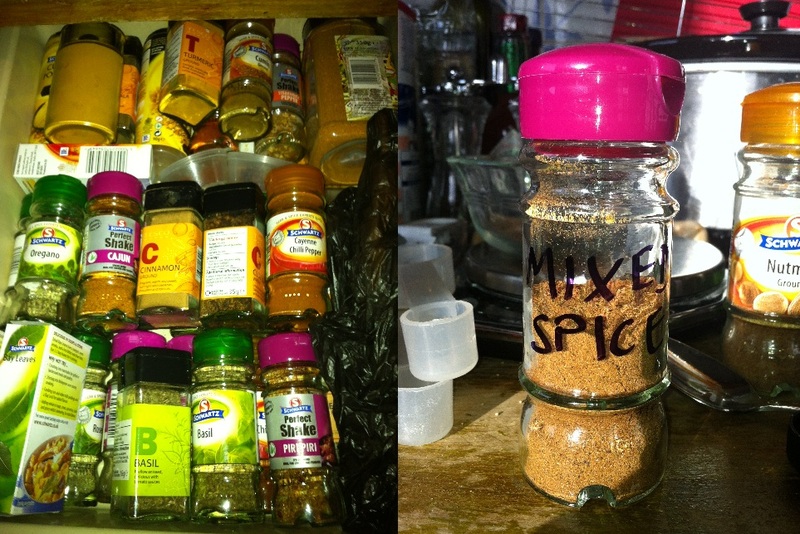 Now for this recipe I didn't have any mixed spice to hand but I did have a variety of spices in my spice/herb drawer so I searched around on t'net and made the mixed spice myself. 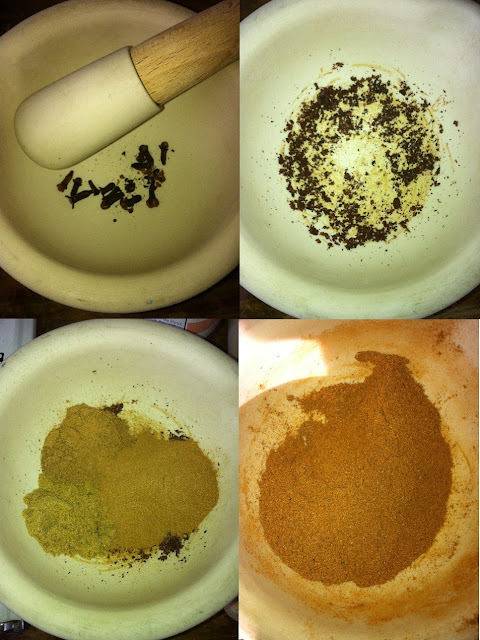 I didn't have ground cloves but had whole cloves so I started by grinding them in my trusty pestle and mortar. Then I dumped everything else in and gave it all a good grind (wow, that sounds rather sordid. Oh well). I made the recipe pretty much as directed except (as usual, I can't just stick to a recipe!) I didn't have any mixed peel and in all honesty I'm not a massive fan of my Hot Cross Bun being citrus-ey tasting. Here's a handy tip for working out what "hand-hot water is" (I mean, its not exactly a scientific statement is it?? What is lukewarm to me is hot to my little one!) Anyway, go by this method - 1 part boiling water to 2 parts cold water. Bosh - hand-hot water. They smelled amazing when they were cooking. Filled the whole house with a bready, spicy aroma. Better than a Yankee Candle! As you can see I didn't make the white crosses - I simply didn't have time to make shortcrust pastry as the recipe suggests. However, on the Delia website she suggests making the white crosses using "a flour and water paste made with 4 oz (110 g) plain flour and approximately 3 tablespoons water. Roll out thinly and divide into small strips, dampening them to seal" so I'd try that next time. Much simpler! The best BEST way to serve them is cut in half, toasted and smothered in butter. Bloody gorgeous! I took them into work and they went down a treat. One colleague ate 2...a second ate 3...he claimed he was doing me a favour. Personally these are the best thing I've made yet. I had one for breakfast all week and every time I opened the tub I got a waft of spicy goodness. Yummers.